It was all supposed to be so different. Eden Hazard started this game on the bench, and we were hoping he could stay there. In fact, we were really hoping that a couple of early goals would help us keep him on the bench for the entirety of the 180 minute tie. It wasn’t to be. 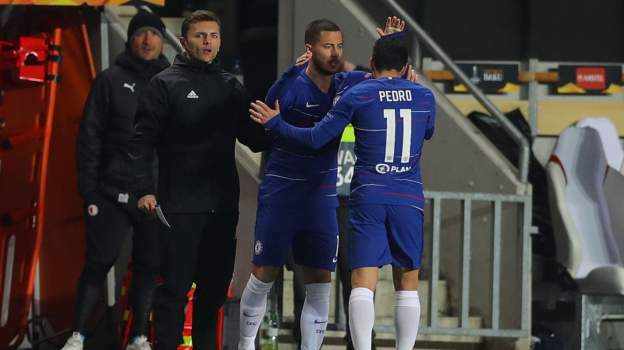 A performance that wavered from dull to shaky has meant that before even an hour had passed without his presence, Maurizio Sarri was calling Eden Hazard back from his warmup. Now, the other player who needed rest the most, N’Golo Kante has also been thrown on. Regardless of how the result ends up, that is a failure in itself. Clearly our manager is going all out for the away goal, but we will pay the price for that with these extra minutes in their legs come Sunday when we play Liverpool. This wasn’t the plan guys. It was all to be supposed a lot easier than this. Let’s hope at the very least that the big boys can get it done.